A Beautiful kitchen back in my home town. This commission was a pure pleasure. Stunning Grade 1 listed Edwardian terrace house, a stones throw from the sea. Refurbished fully in keeping with the airy ancestry of this fabulous listed building. SQ1 Design Workshop were commissioned to design & manufacture this bespoke kitchen. The materials used were oak & oak veneers and brass cladding. 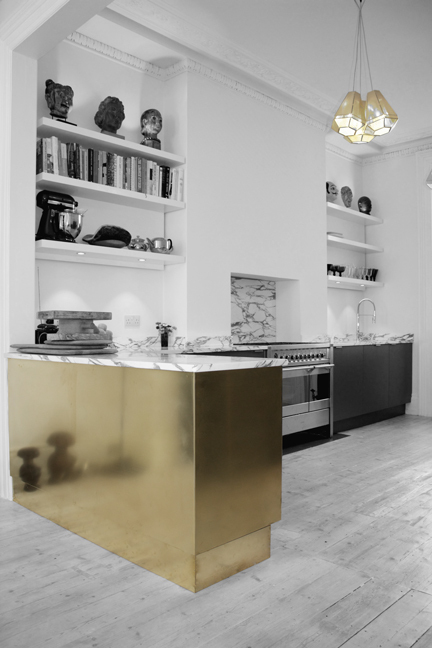 The brass edge pulls were a treat from Simonswerk & Arabescato Carrara marble, like a dolcelatte, complimented the Storm Formica colour core of the doors & drawer fronts. Love the lights too...! !